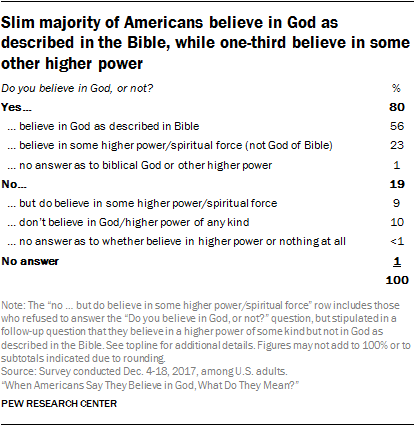 Nine-in-ten Americans believe in a higher power, but only 56% believe in God as described in the Bible. These trends raise a series of questions: When respondents say they don’t believe in God, what are they rejecting? Are they rejecting belief in any higher power or spiritual force in the universe? Or are they rejecting only a traditional Christian idea of God – perhaps recalling images of a bearded man in the sky? Conversely, when respondents say they dobelieve in God, what do they believe in – God as described in the Bible, or some other spiritual force or supreme being? These are among the key findings of the new survey, conducted Dec. 4 to 18, 2017, among 4,729 participants in Pew Research Center’s nationally representative American Trends Panel, with an overall margin of sampling error for the full survey of plus or minus 2.3 percentage points. Evangelicals and those in the historically black Protestant tradition are also more likely than members of other major U.S. Christian traditions to say that God has personally protected, rewarded and punished them. But across all subgroups, Christians are far more likely to say God has protected and rewarded them than to say God has punished them. 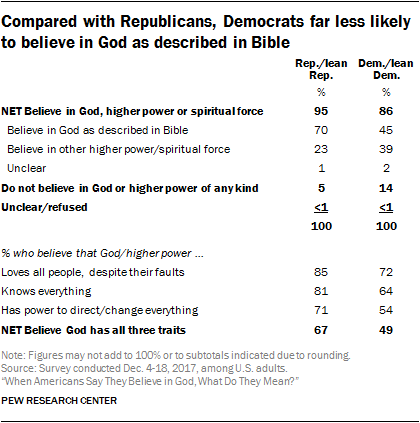 Additionally, while 85% of Republicans believe God loves all people, eight-in-ten believe God is all-knowing, and seven-in-ten believe God is all-powerful; Democrats are less likely to express each of these views. 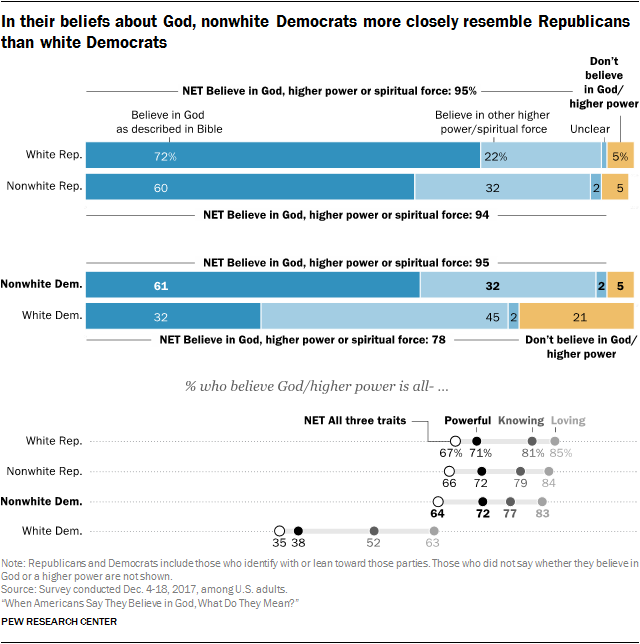 Two-thirds of Republicans say they believe God possesses all three of these attributes, compared with roughly half of Democrats (49%). Republicans also are more likely than Democrats to say God has protected, rewarded or punished them. 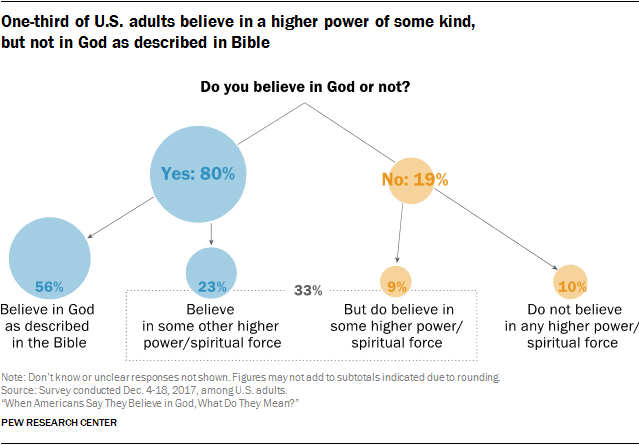 Virtually all U.S. Christians say they believe in God or a higher power of some kind. Among evangelical Protestants, 91% put their faith in God “as described in the Bible,” as do 92% of those in the historically black Protestant tradition. Most Catholics and mainline Protestants also believe in the God of the Bible, though sizable minorities within these groups say they believe in some other higher power or spiritual force. Like Christians, most Jews believe in a deity. 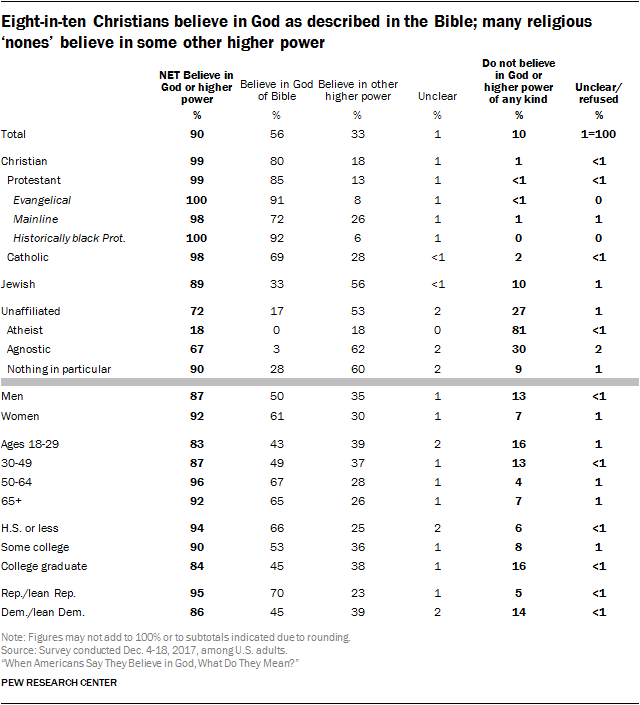 But compared with Christians, Jews are much more likely to say they believe in a higher power other than the biblical God (56%), and much less likely to say they believe in God as described in the Bible (33%). 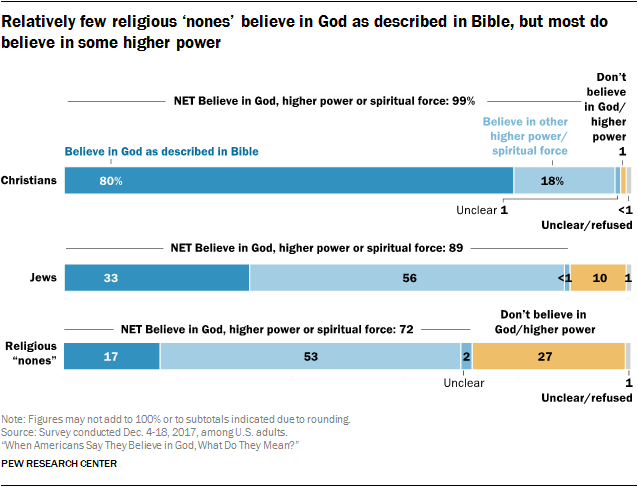 And one-in-ten Jews say they do not believe in God or a higher power of any kind. 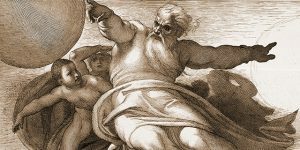 The survey shows that a complete lack of belief is relatively uncommon even among religious “nones.” Seven-in-ten religious “nones” say they believe in God or a higher power of some kind, including 17% who believe in the biblical God and 53% who believe in a different higher power or spiritual force. 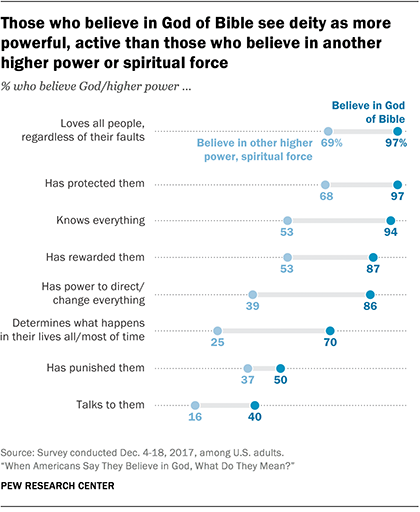 Self-described atheists are the only group surveyed in which a majority (81%) rejects belief in a higher power altogether, and even among atheists, roughly one-in-five (18%) say they believe in some spiritual force. Belief in God as described in the Bible is more common among women than men (61% vs. 50%), among older people than among younger adults, and among Republicans and those who lean toward the GOP than among Democrats (70% vs. 45%). The survey also shows that belief in the biblical God is least common among the most highly educated Americans. Nine-in-ten Christians say they believe God or another higher power in the universe loves all people despite their faults, and nearly as many say they think God is all-knowing. A smaller majority of Christians believe God is omnipotent, with the power to direct or change everything that goes on in the world (78%). Evangelicals and those in the historically black Protestant tradition are most likely to attribute these characteristics to God, though majorities in all Christian groups say God is loving, omniscient and omnipotent. Among demographic groups, women are somewhat more likely than men to say God is all-loving or all-knowing, though they are not much more likely than men to view God as all-powerful. The beliefs that God is all-loving, all-knowing or all-powerful are more common among older people than younger adults, and among Republicans than Democrats. Three-quarters of U.S. Christians, including 91% of those in the historically black Protestant tradition and 87% of evangelical Protestants, believe God is all-loving, all-knowing andall-powerful. 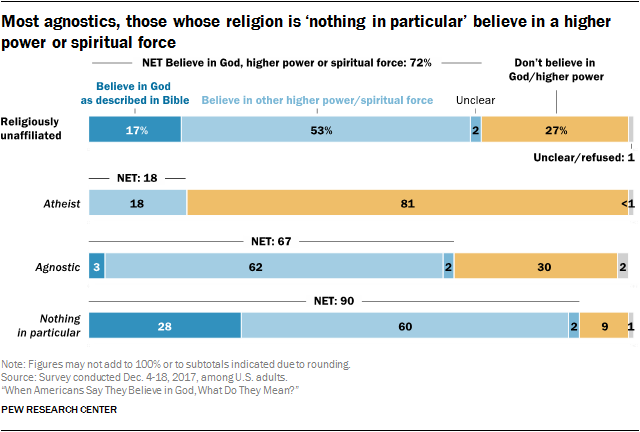 By comparison, Jews and religious “nones” are far less likely to say God (or another higher power in the universe) possesses all three of these attributes. 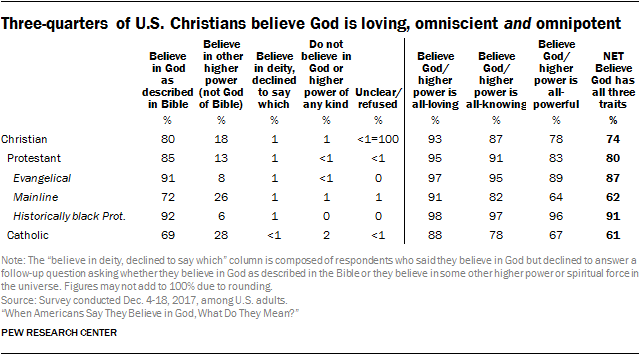 Among respondents who say they believe in God as described in the Bible, fully eight-in-ten (83%) say they believe God is all-loving, omniscient and omnipotent. By contrast, among those who believe in a higher power but not the God of the Bible, just 28% say God has all three of these characteristics. There are similar patterns on another question: whether God will ultimately judge all people based on what they have done in life. Overall, six-in-ten Americans believe God or a higher power will someday judge all people. This view is most common among evangelicals (87%) and those in the historically black Protestant tradition (85%), and held by smaller majorities of other Christian groups. Most Jews and religious “nones” (some of whom do not believe in God or a higher power in the first place) reject the idea that people’s deeds will ultimately by judged by a higher power. Seven-in-ten adults ages 50 and older think all people will ultimately face God’s judgment. By contrast, just 56% of those in their 30s and 40s and half of adults under 30 (49%) say the same. Three-quarters of Republicans and those who lean toward the GOP (74%) think all people will have their actions judged by God. Among Democrats and those who lean toward the Democratic Party, about half (51%) express this view. About three-quarters of Americans say they try to talk to God or another higher power. And 28% indicate that their attempts at communication are answered, saying God or the spiritual force in the universe talks directly with them. Communicating with God is most common among evangelical Protestants and those in the historically black Protestant tradition, with nearly everyone in both groups saying they talk to God. Six-in-ten people in the historically black Protestant tradition say this communication is a two-way street and that God talks directly with them; 45% of evangelicals say the same. Compared with Christians, fewer Jews (63%) say they communicate with God, and just one-in-ten U.S. Jews (9%) say God talks to them. Even fewer religious “nones” (46%) say they speak to God or a higher power they believe in, but among the subset of “nones” who describe their religion as “nothing in particular,” two-thirds (65%) say they do indeed try to talk to the deity – and roughly one-in-five say God talks back. As with so many other measures of belief and engagement with the divine, women are more likely than men to say they communicate with God, and those over 50 are more likely than younger adults to say this. Talking to God is less common among college graduates than among those with less education. When asked whether they have ever been protected by God, three-quarters of Americans (including 93% of Christians) say yes. And two-thirds of U.S. adults (including about eight-in-ten Christians) say they have been rewarded by God at some point in their lives. Far fewer people – just four-in-ten U.S. adults and 47% of Christians – say there has been a time when they were punished by God. Overwhelming majorities of all Christian traditions say they have been protected by God. Similarly, the share of Christians who say they have been rewarded by God ranges from 70% among mainline Protestants to 96% among those in the historically black Protestant tradition. By contrast, those in the historically black Protestant tradition (61%) and evangelicals (56%) are the only Christian subgroups in which more than half of respondents say they have been punished by God. Analysis of the survey data reveals that those who believe they have been rewarded by God are divided between those who have been rewarded and punished (38% of all adults) and those who believe they have been rewarded but not punished (29%). 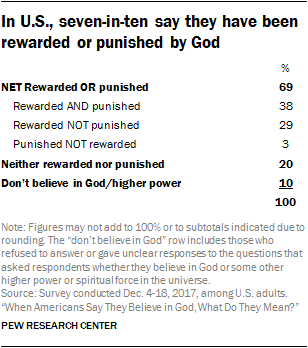 Very few Americans say they have been punished by God without also having been rewarded (3%). This relative optimism about God’s involvement in life is consistent with previous studies that have shown, for example, that the share of Americans who believe in heaven is significantly larger than the share who believe in hell. The belief that God is responsible for all or most things that happen in life peaks at 82% among those in the historically black Protestant tradition, and this view is shared by 72% of evangelical Protestants. More than half of Catholics (56%) also see God’s hand at work in all or most things that happen to them, as do 53% of mainline Protestants. Among demographic groups, more women than men see God at work in all or most of what happens in their lives. There is also a big gap between college graduates and those with less education. 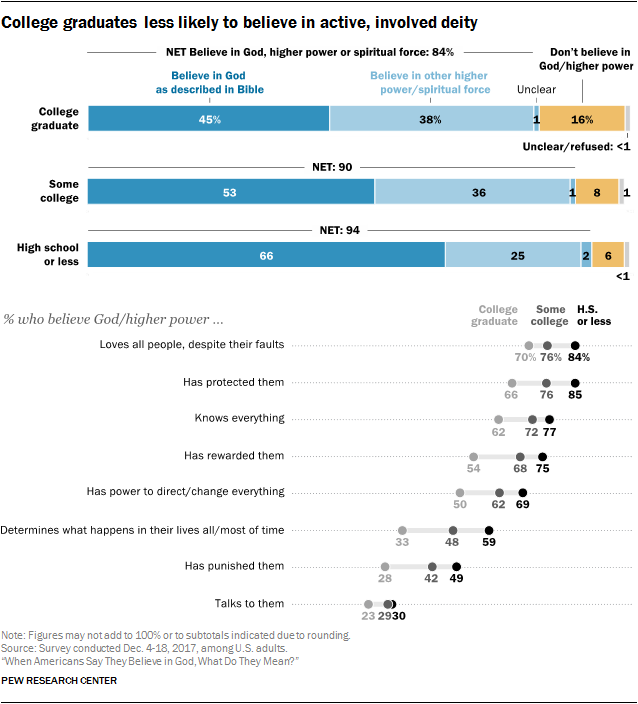 Among adults who have a high school degree or less education, a majority (59%) believe God is largely or entirely responsible for what happens to them; roughly a quarter believe God hardly ever or never determines the course of their lives (17%) or reject belief in a higher power altogether (6%). By contrast, among college graduates, nearly half say God determines little or nothing of what happens to them (29%) or doesn’t exist at all (16%), while only one-third see all or most of what happens to them as God’s handiwork. 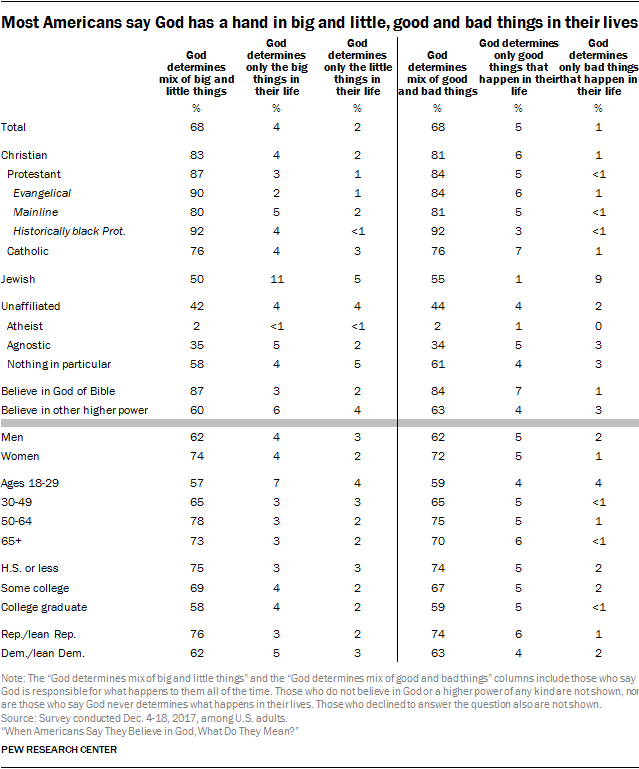 Respondents who indicated that God determines what happens in their lives occasionally (i.e., at least “hardly ever” but not “all the time”) were asked whether God determines only the big things in life or the little things (or both), and were separately asked whether God determines only the good things, only the bad things, or both. Similarly, just 5% say God is responsible for only the good things that happen to them, and 1% say God is behind only the bad events in life. Most adults see God’s hand at work in both positive and negative things. Nick Bertoni, panel manager for the American Trends Panel, and Claudia Deane, vice president of research, also gave valuable feedback on this study. Originally published by Pew Research Center, reprinted with permission for non-commercial purposes.